“The Malay paper for IGCSE is quite simple. So, I develop the course outline based on what I believe is needed for the students, beyond IGCSE’s requirement. But I found the content is overwhelming. Too many to cover (in a semester)” one of our teachers said during our consultation hour. She has just recently joined us after her graduation and a short service as a substitute teacher in public schools. This is a good example to contrast a teacher-centered classroom against a learner-centered classroom. To transform the teacher-centered classroom, a teacher needs to embrace the point that students need to play their active role as knowledge builders and teachers must step back from the front side of the classroom. How to reflect that on the course outline? A teacher needs to tolerate the function of content, and reflect on the learning outcome he or she wants the pupils to achieve. Look at the content as a whole. Understand the subject as a one big unit. Get the big picture. Summarise the content, and explain the rational behind your summarisation. 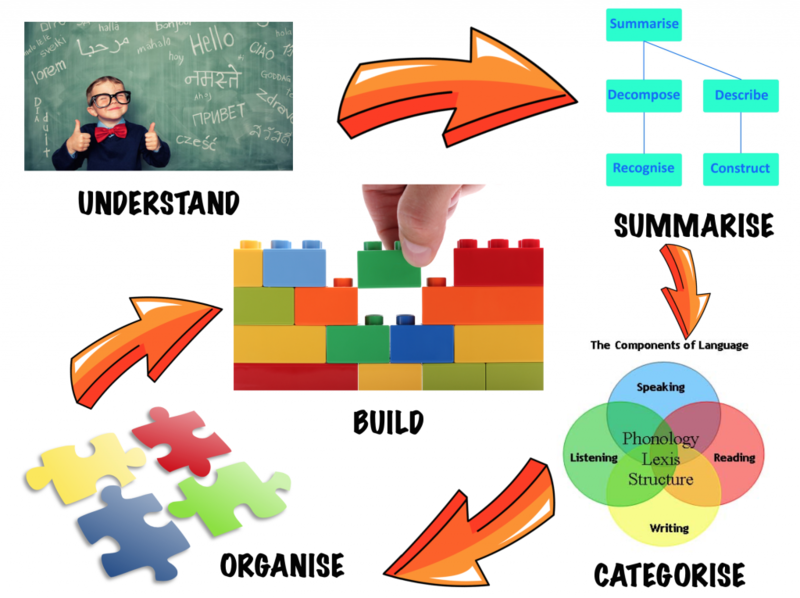 Use a diagram for example, to visualise the flow of content from one category to another, from one point to another. Again, try to categorise the content and organise them into themes. Separate the themes from each other. Evaluate the themes, criticise them and question if each of the themes can stand on its own as a module. Build the course outline based on the themes into several modules. This means, a teacher must have a strong sense of big picture of the subject he or she teaches, and possesses good details when the subject is zoomed in. But at this transition period, I don’t prefer teachers to create a lesson plan on daily basis. I don’t ever prefer it to be called as a lesson plan. When a teacher has a lesson plan, he or she will ‘teach’. Perhaps at this stage, we will call it as a lesson strategy. We have nobody from authorities to pressure us on reporting. Our ‘business’ in Khalifah Model School (Secondary) is only assisting the students to learn. Knowing how to know is always our priority, against the knowledge and gathering them. So, put your trust on your capability to develop, use your critical and creative mind, enjoy being a teacher.